The subject of vibrations is of fundamental importance in engineering and technology. Discrete modelling is sufficient to understand the dynamics of many vibrating systems; however a large number of vibration phenomena are far more easily understood when modelled as continuous systems. The theory of vibrations in continuous systems is crucial to the understanding of engineering problems in areas as diverse as automotive brakes, overhead transmission lines, liquid filled tanks, ultrasonic testing or room acoustics. Starting from an elementary level, Vibrations and Waves in Continuous Mechanical Systems helps develop a comprehensive understanding of the theory of these systems and the tools with which to analyse them, before progressing to more advanced topics. Presents dynamics and analysis techniques for a wide range of continuous systems including strings, bars, beams, membranes, plates, fluids and elastic bodies in one, two and three dimensions. Covers special topics such as the interaction of discrete and continuous systems, vibrations in translating media, and sound emission from vibrating surfaces, among others. Develops the reader’s understanding by progressing from very simple results to more complex analysis without skipping the key steps in the derivations. Offers a number of new topics and exercises that form essential steppingstones to the present level of research in the field. Includes exercises at the end of the chapters based on both the academic and practical experience of the authors. 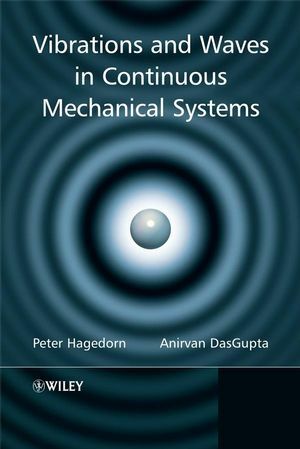 Vibrations and Waves in Continuous Mechanical Systems provides a first course on the vibrations of continuous systems that will be suitable for students of continuous system dynamics, at senior undergraduate and graduate levels, in mechanical, civil and aerospace engineering. It will also appeal to researchers developing theory and analysis within the field. Dr. Peter Hagedorn Dynamics and Vibrations Group, Department of Mechanical Engineering Technische Universität Darmstadt has over 200 publications which includes papers in international journals (such as ASME Journal of Applied Mechanics, International Journal of Non-linear Mechanics, Journal of Sound and Vibration, Journal of Fluids and Structures, Journal of Vibration and Control Nonlinear Dynamics, Journal of Vibrations and Acoustics, Archive for Rational Mechanics and Analysis, AIAA Journal, Journal of Optimization Theory and Applications, Wind and Structures, ZAMM, ZAMP), refereed conferences, book chapters, lecture notes and books. The books are: Nonlinear oscillations. Since 1974, he is a Professor at TU Darmstadt (Germany). He has 7 patents to his credit. He has taught various courses such as Vibrations of continuous systems, Machine dynamics, Multi-body dynamics, Statics, Theory of elasticity, and Dynamics. He has been Visiting Professor at COPPE, Rio de Janeiro (Brasil), Lecturer at University of Karlsruhe (Germany), Research Fellow at Stanford University (US), Visiting Professor at UC Berkeley (US), Universities in Paris (France), Irbid (Jordan), and Christchurch (New Zealand). He has also served as the Director of the Institute of Mechanics, Dean, and Vice-President, all at TU Darmstadt. Dr. Anirvan DasGupta Indian Institute of Technology Kharagpur, Kharagpur - 721302, INDIA obtained his Doctoral degree in Mechanical Engineering from IIT Kanpur (India) in 1999. He has about 35 publications which includes papers in International journals and refereed conferences. He joined the Mechanical Engineering department at IIT Kharagpur (India) in 1999 as an Assistant Professor, and is presently an Associate Professor. He has taught courses such as Mechanics, Dynamics, Kinematics of Machines, Dynamics of Machines, and Machine Vibration Analysis. He has supervised two Doctoral students. He has been at the University of Tokyo (Japan) as a research fellow, and at TU Darmstadt (Germany) as an Alexander von Humboldt research fellow.